12 v coffee maker is not for everyone! Owners of 12 v coffee maker all have one thing in common -patience! This coffee maker was not designed to be fast or instant, it was make to accompany you on long road trip, and I guess the designer might have thought that in a road trip, you have lots of time. Although, there are some 12 v coffee maker that boast of capability to brew in under 12 minutes, I seriously doubt it. Using the cigarette plug in your car, and taking into a account a 12 vsupply, I do not think it is possible that any coffee can be brew in less than 30 minutes. Just in case, you want to buy one of these 12 volts coffee machine, the average time to get the coffee to brew is 45 minutes and the fastest is 30 minutes. So, if you have this machine and expect to have hot coffee the moment you are settle in your camp site, do adjust your expectations accordingly. Other than the slowness to brew, the temperature of the coffee is also a common complain. There are a lot of variables affecting the temperature of your brew, but ultimately it is the battery capability of your car or boat that makes the difference. I have seen so many feedback on folks that complained about their 12 v coffee maker not achieving boiling temperature and the maximum temperature that they are to achieve is luke-warm. But, have they consider running their engine rather than depending on their battery. Moreover, depending on your location and altitude, the boiling temperature and the environment have an effect on the brew temperature as well. 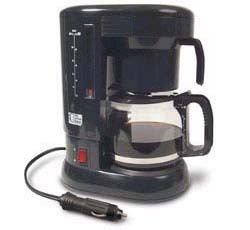 If you read until here, you might given up hope on 12 volts coffee maker, deciding that cowboy coffee (those brew over open fire) is easier or even 3-in-1 is better than having to go through all these hassle. However, if you do some homework and ensure that the voltage supplied is enough for your coffee machine, having drip filter coffee in the "wild" is a very cool. It not only bring back the feel of home, it bring back memories of coffee with love ones if you are on one of those road trips.